Prelude: Since being introduced in “All Hail Megatron”, Drift has been a bot of many colors. He’s been white in G1, red in Shattered Glass, orange in RID, blue in Age of Extinction, and now he’s back for The Last Knight in black and red. Sadly the Studio Series incarnation will simply replicate the look from The Last Knight instead of taking the next logical step and coloring him green. But hey, it’s Drift, the alien robot from the American toy line that looks like a Japanese Samurai and becomes a German car after previously becoming a French car. Here he is in his The Last Knight Premium Edition incarnation. Robot Mode: First of, Drift here is an extensive retooling of the previous Age of Extinction Drift. The robot is more or less the same, but the entire vehicle shell has been replaced. Given that Drift is very much a shell-former, that works out quite nicely. He carries his car shell on his arms, legs, and back. Unlike AoE Drift, the hood of the car on his chest is a fake, as the real one is on the back of his feet. The actual robot is mostly red, while the car parts are black and his Samurai-style face mask is colored golden. All in all there is a bit too much red on the robot for me, it should have been broken up with some colored highlights. Drift comes with no less than four swords, two long ones, two short ones. I am sure they have proper Japanese names, but I’m too lazy to look them up. One of them is probably called a Katana, I believe. Anyway, Drift can wield his swords or store them on his body. The short ones go behind his head, the long ones can be attached to his hips. Articulation is pretty good, Drift can pull off kicking and sword fighting poses without any problems. All in all I’m left with mixed feelings regarding this robot mode. There is nothing about it that’s really bad in any way, but nothing that really appeals to me, either. Alternate Mode: Drift has shed his Bugatti vehicle shell from the last movie and now transforms into a black 2017 Mercedes-AMG GT R. Man, I still remember when German car companies wanted nothing to do with the Transformers movies because they didn’t want to be involved with toys glorifying war. Times have changed, yes they have. Now Volkswagen and Mercedes gladly rake in the movie dollars. When are we getting a BMW Transformer, by the way? The car looks pretty neat, though a few more painted details wouldn’t have hurt. The car’s hood doesn’t quite aligned with the sides, but I’m not sure whether that’s a general problem or just a thing with my version. All of Drift’s weapons can be stored in car mode, the daggers under the hood, the swords under the car. Of course when looking at the underside you pretty much see Drift’s entire robot mode, but from all other angles the disguise works just fine. So all in all a decent care mode, some bonus points for being a German car, but nothing too spectacular here. 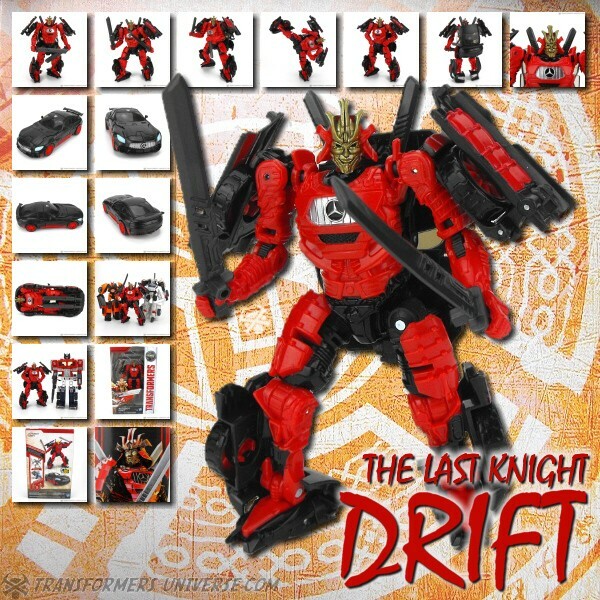 Remarks: I spent some minutes out of my day trying to remember what exactly Drift was up to in The Last Knight. Now granted, I’ve only seen the movie once, but for the life of me I can’t remember that he did anything more than hang out in a junkyard with some baby Dinobots (and the less thought about that, the better). So, yeah, thanks for going to all the effort of scanning an entirely new altmode and changing your colors, Drift. You really lightened up that junkyard. Oh, I think he cut off some Decepticon’s head, too, now that I think about it. But hey, which Movie Autobot hasn’t? Drift is yet another robot that found itself in my collection via a raffle win, as I never intended to buy him. Come to think of it, I only ended up buying three Last Knight figures in stores, yet I got my hands on quite a few more of them through various means. I need to figure out how to make that work for Titan Class figures. Anyway, where was I? Oh yeah, Drift. Never much cared for the character and while the toy isn’t bad as such, it doesn’t stand out in any way, either. So the best I can say here is that’s an average Movie-line figure with no flaws. Oh, and it’s a German car.